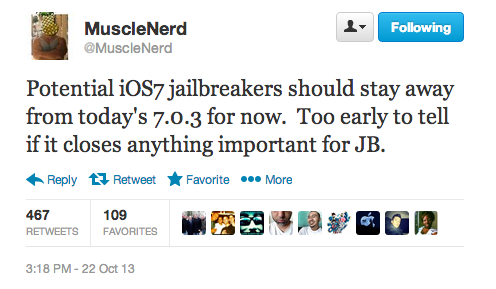 MuscleNerd has is warning potential iOS 7 jailbreakers to stay away from today's iOS 7.0.3 update as a precautionary measure. It is unlikely that Apple slipped in any intentional fixes to prevent any jailbreak, but until the evad3rs verify that their current exploits are working, it is safe to stay away from 7.0.3. We will let you know once/if 7.0.3 is a safe update. If you have already updated, Apple is still signing 7.0.2, but this will most likely be closed in the next hour. If the window is closed, and you're stuck on 7.0.3, there still is hope for a jailbreak.